Stanford Uck or Douglas Baader? Which Hurricane Mk.I should I paint first? So I decided to let the community have a say in what my first Hurricane Mk.I Repaint will be. I have narrowed the choices down to a pair of famous Aces that flew the Hurricane during the Battle of Britain, Douglas Baader and Stanford Tuck, or an earlier, more generic Hurricane from the Battle of France/Dunkirk evacuation period. So which of these three will it be? Cast your vote and let's see. Can you post some pics you might design from? I mean I could vote for who I think is the coolest guy but then you might give his plane a Hello Kitty skin . Good idea, I didn't even think about that. 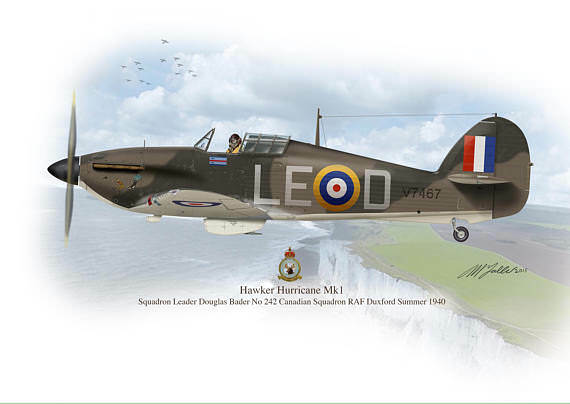 Here are a couple of links to model airplanes of Stanford Tuck and Douglas Baader's Hurricanes. I've not settled on a BoF/Dunkirk era plane yet. I though a patten for tropical, africa, the advanced force in France and home. Possibly you could follow #73 squadron from France to home to North Africa. Must remember "look then talk"